- I've been lucky enough to summit West Bond sixteen times over the past few years, and even luckier to catch stunning views for every single hike to the remote peak. Every time I stand on the summit I look with fascination over to the slides below Guyot and the Twin Range, as I'm in awe of the remoteness of the steep slides. What catches my eye more than the enormous slides is a small body of water tucked away below one of the steep slides in the Redrock Ravine. It quietly shines at the floor of the ravine with a small talus field rising above it's shore. (Click here for picture of Pond / click here for picture of slides). Since I first saw it I knew eventually one day I had to find it! - Bear Pond sits deep in the Pemigewasset Wilderness, it's east of Owl's Head, south of Southwest Twin, north of West Bond, and west of the Twinway between South Twin and Mount Guyot. By looking at the map the route is pretty straight forward, follow the Franconia Brook trail and once past the Lincoln Brook Trail junction follow the trail until the second major brook crossing which is Redrock Brook. From here, by looking at the map you follow the brook all the way to the pond. However, as with all things, it's not as easy as what it looks like on a map, but it is a good starting point. I knew of old logging and railroad grades to look for north of the brook, I also knew not to head to the right or I'd end up below the huge slides that sit below Mount Guyot. - I followed the brook, it wasn't too thick but I knew there was a railroad grade close by, so I looked up to my left and headed up the embankment and within a couple of minutes I was on the old railroad bed making for much smoother travel. I followed the railroad grade until it seemed to disappear into a dry streambed. I was a little confused because I thought there would be water running all the way to the pond. So I headed to my right just a little and started wandering through the woods, I had some doubts that I was in the wrong spot, could I have ventured off to far south and was now heading into the little nook below the double slides of Mount Guyot? Luckily the higher summits were below the clouds so I could get a good bearing and I kept on hiking up. I remember seeing a picture from Tim C's album where he had lunch on a talus field rising above the pond, I kept this in my mind as I looked through the trees to my left hoping to catch a glimpse of it. As luck would have it, after a few minutes I caught a view of it through the trees and immediately headed left towards the pond. - I had made it, well almost, I had to navigate a fortress of pines and blowdowns protecting Bear Pond. It was pretty gnarly stuff but I was unphased. Within a few minutes I stumbled out of the woods to the shore and directly across from me was the talus field! - I made my way around the shore, past the outlet, and up onto the talus field, making sure not to fall into the water as I was wearing my trail runners and wanted to have dry feet until making my descent. - I had lunch on the talus field, taking in the views, and what views they were! To my left was a huge steep slide and in front of me was West Bond with a jumbled boulder slide sitting below the West Bond Col! - What a place to visit, I have to say along with Hawthorne Falls, Bear Pond in Redrock Ravine are two of the most beautiful and remote places I have ventured to in the Whites! - Finally, after about a half hour or so I made my way back to the Franconia Brook Trail. On the way down I followed the dry steambed and then hooked onto the railroad bed. I jogged quite a bit of it as the railroad grade is in decent shape. Along the way I stumbled upon a three foot piece of the railroad rail, what a cool find. - Eventually the railroad bed bends to the north away from Redrock Brook, I followed it for another tenth of a mile before jumping off and descended down towards the Franconia Brook Trail. I intercepted two skidder roads before eventually popping out on the Franconia Brook Trail about two tenths of a mile north of the crossing of Redrock Brook. - From here I made my way out of the Pemi Wilderness. I had not seen anyone all day until I reached the wilderness boundary. From the wilderness boundary back to the car I saw few people here and there but it was a relatively quiet walk out. - About a mile from the car I caught up to a hiker who had hiked West Bond, I told him where I just came from and to my surprise it turns out he had been to Bear Pond four times! He's even hiked up the slide below West Bond that can be seen from the talus field. Pretty freaking cool! This made the last mile out really enjoyable as we both talked about old abandoned trails and bushwhacks. - Back at the car I changed out of my muddy shoes realizing how lucky I have been to hike to some remote places over the past few months; Adams Slide, Whitewall Mountain, Hawthorne Falls, Lincoln Slide, and now Bear Pond in Redrock Ravine. It's nice to step off the trail and out of your comfort zone every now and then! flooded area of the trail, notice the ancient stump! It got really thick the last few hundred feet! RR junk, how cool is that! Great account! Sounds like a neat hike, and one worth filing away this post for. Thanks Rickey! It's a great place to explore. I hope to get in there again and explore some birch glades I heard about form the guy I hiked out with and that slide below West Bond! Excellent place to explore (and camp.) 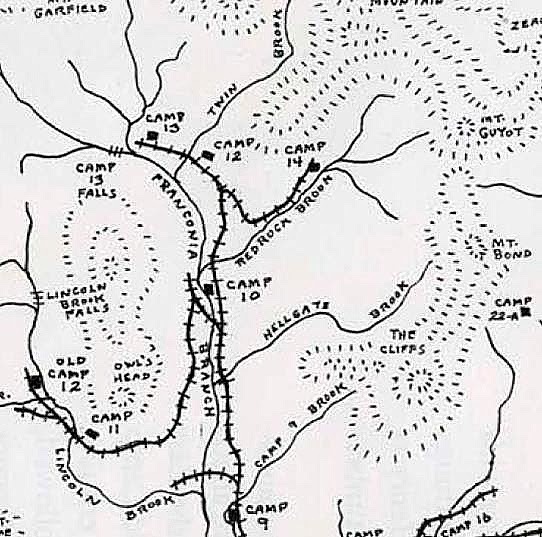 I like your project to hike the lumber camps - I've started to do the same just to get a feel for the history and to check out any artifacts I come across. A few weeks back we stumbled across an old horseshoe, so much history and a lot to explore! Chris, this adventure was off the scale in terms of 'awesomeness'! Excellent execution of 'game plan', and fabulous photo documentation of your trek. And lastly, I totally agree with the last sentence in your narrative, i.e. "It's nice to step off the trail and out of your comfort zone every now and then!" Thanks John! Glad you liked the pictures, I hope to step out of my comfort zone more often as I gain more off trail experience! I always head to your blog to check out your off the beaten path treks for ideas! Great report and photos - my favorite place in the Pemi! If you head back sometime, there's a good way through the thick stuff at the edge of the pond far to the right of the outlet brook over a pile of talus rocks near the edge of the field. Thanks for the info, much appreciated. I'll definitely have to head through the talus field to help navigate the thick stuff. Such a great place, can't wait to go back!